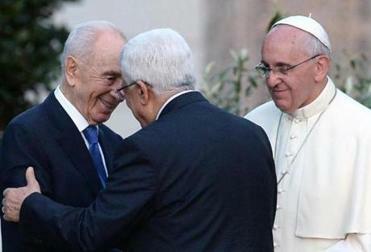 Israeli President Shimon Peres and Palestinian President Mahmoud Abbas joined Pope Francis at the Vatican. By that standard, Francis showed that Catholicism on his watch is alive and kicking by delivering one of the greatest surprises of his papacy — a peace summit that is likely to have no immediate effect whatsoever on the Middle East peace process, but that yet still managed to feel like a historic turning point. In truth, going into Sunday’s prayer with Palestinian President Mahmoud Abbas and Israeli President Shimon Peres, neither the pope nor his advisers was expecting a miracle. “Anybody who has even a minimum understanding of the situation would never think that as of Monday, peace will break out,” said the Rev. Pierbattista Pizzaballa, a Franciscan priest based in the Middle East who organized the event. The pope’s lone ambition, he said, was to “open a path” that was previously closed. 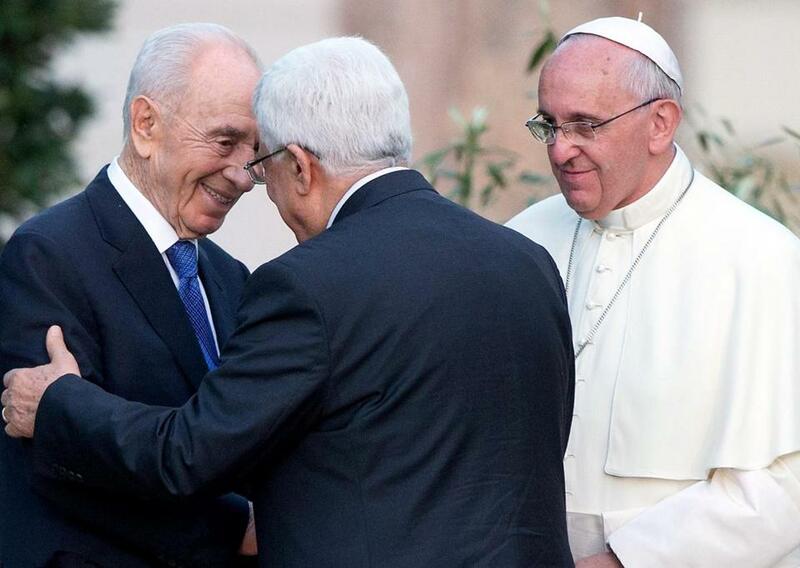 Pope Francis was joined by Israeli President Shimon Peres and Palestinian President Mahmoud Abbas at the Vatican. Yet even if nothing results on the Israeli-Palestinian front, there are three reasons why Sunday’s “invocation for peace” was much more than a photo-op. First, it represents a revitalization of the Vatican’s diplomatic capacity after a period in which it hit a nadir. Three years ago a veteran Italian journalist published a book called “Once Upon a Time, There Was a Vatican,” documenting how an institution that boasts the world’s oldest diplomatic corps was flirting with geopolitical irrelevance under Pope Benedict XVI. He opened with a scene at a reception in which an ambassador compared the situation to the dying days of the old Republic of Venice, speculating that in 10 years few of the countries represented that night would even bother having diplomatic relations with the Vatican. Nobody is saying that kind of thing anymore. Even if all Francis does is give cover to leaders of contending factions to come together for prayer, that is still a channel of backdoor diplomacy that did not exist before. As Abd Al-Majeed Ata, the mufti of Bethlehem, said, it is also an astute recognition that in the Middle East “religion comes first,” and problems have to be engaged on a spiritual level. Second, Sunday’s event solidified a Vatican recipe for making prayer with the followers of other religions theologically acceptable. Whenever popes have staged such events in the past, there has always been blowback in traditional Catholic circles insisting that such exercises violate previous edicts against “indifferentism,” meaning the idea that all religions are equal, and that it amounts to a sort of New Age sacrilege. Those stipulations were not just important for Catholics, because many Jews and Muslims also have reservations about blurring boundaries. Clarity about not “praying together” was thus a gesture of respect for the sensitivities of Francis’ guests. That is, one thing Christian leaders can do together that does not require a doctrinal breakthrough is to pool resources as troubleshooters, with their combined moral authority making the appeals more difficult to resist. Granted, there was a specific logic for Bartholomew’s presence Sunday. Francis issued the invitation to Abbas and Peres during his recent trip to the Middle East and hoped to stage the prayer there. Since the official motive for the visit was to meet Bartholomew, had the plan worked Bartholomew likely would have been involved. Yet Francis surely grasps that after Sunday, Bartholomew will be expected to be by his side anytime he wades into a conflict, and it is safe to assume the pontiff welcomes it. To sum up, what Francis accomplished was putting the Vatican back on the geopolitical map, avoiding a quagmire in interreligious relations, and providing a shot in the arm to Christian unity. Even without a peace deal, that does not seem bad for a night’s work. John L. Allen Jr. is a Globe associate editor, covering global Catholicism. He can be reached at john.allen@globe. com. Follow him on Twitter @JohnLAllenJr and on Facebook at www.facebook.